How do I know which thickness of Clip in hair to choose? Truth or Hair offers three thickness options for our sets: 80 grams,130-16 grams and 220grams. If you want a custom made thickness, please email infor@truthorhair.co.za and we will gladly provide you with a quote. 80g Basic sets are for fine hair types. It will add length and a little volume to your hair, while still looking natural. 130- 160grams are our most popular sellers as they are suitable for all hair types but are highly recommended for those with medium to thick hair. It will add length as well as blend in naturally with your already thick hair, giving a flawless natural look. 220g sets are for the women who want that wow look. It will not only add length, but also enough volume so that you will look like a celebrity. Definitely a top seller. The lifespan of your Truth or Hair Clip in Extensions is between 6 months to a 2 years, depending on usage and how well you look after them. Daily wear, the use of heated styling tools, and frequent washing all contribute to the wear and tear of your extensions. To help extend longevity of your extensions we advise that you do not sleep with your hair extensions in, always using salon-grade heat protectant sprays, and only washing your extensions every 10 – 20 wears. We have had customers tell us they have had their sets for two years, and it still looks perfect. How do I attach my Clip in hair Extensions? Start by parting the section of your hair in line with your earlobes. Open the clips and attach them as close to the roots as possible; starting with the middle clip. Repeat steps 1 through 3 at different partings of your hair; starting at the lower half of your head and working your way up. Follow your hairline and be sure to balance them out evenly. You may need one or two practice rounds, but once you get it, it should only take a few minutes. Your extensions should feel secure and will not come out until you unclip them. NEVER try to slide the extensions off without first opening the clip. How do I put in Clip in Bangs? Clip in Bangs are simple and easy to use. You just need to unclip the clips and slide the bangs in at the top of your head. Spend some time playing with them to get them at the right length, and frame for your face. We have made them a little longer so that you can trim the ends to suit your specific needs and frame of your face. Once you’ve got them in the way you want them, blend them into your hair. We recommend wearing a headband with the bangs to hide any possible join which may be visible. Remember to always unclip the clips before taking the bangs out. Never sleep with the bangs in, as this could damage them. Your Clip in hair Extensions should ONLY be washed every 10-20 wears, or when the hair has a build of products and have become unmanageable to style. What if I choose the wrong colour? If you choose the wrong colour you may return your hair Extensions for exchange within 7 days, as long as the quality seal is unbroken and they have NOT been worn. It’s preferable that you choose the correct colour extensions from the beginning, as they have already undergone a chemical process to get them to that specific colour. However, they can be coloured a darker shade, but not lighter, and bleaching them is not recommended. Be aware that colouring your extensions will shorten their lifespan considerably. If you do opt to dye your extensions, we recommend getting them colored at a professional who has had previous experience working with hair extensions. 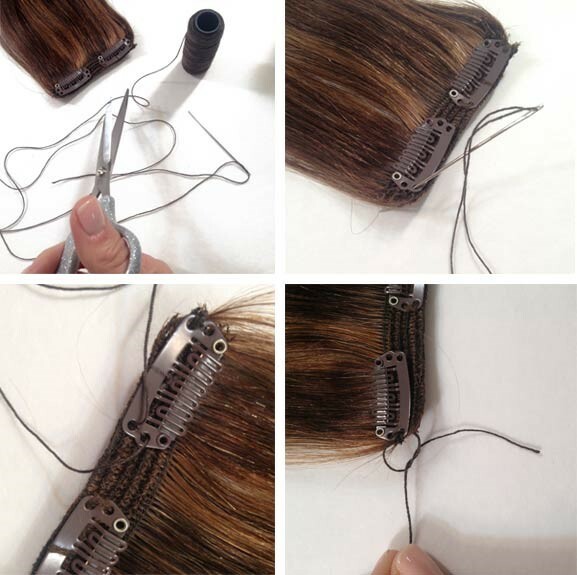 We advise testing a one clip weft prior to coloring the full set to ensure the results are the shade you anticipated. We also recommend using a semi-permanent color, as it is far gentler on the hair extensions. We do not recommend lightening your Clip in hair Extensions, as it will require them to be bleached. Bleaching is a very harsh and harmful chemical process, which will alter the quality of your hair extensions and could potentially severely damage them. Clip in hair extensions are designed to be non-intrusive. The small clips are able to be firmly attached without pulling on your hair or causing irritation to your scalp. Your extensions should be taken out before you go to bed, to ensure that they don’t get tangled. No damage is caused to your own hair when wearing Clip in hair Extensions. What if we don't have what you are looking for? You are welcome to email info@truthorhair.co.za to enquire about a custom order, that we especially have made for you. Special orders might be more expensive than what we currently offer and take longer to ship, but nevertheless worth it. If you accidentally break one of your clips, or it comes loose, don’t panic the Clip in hair Team have you covered. We’ve sent you two replacement clips for just in-case, and these easy to follow instructions will help you quickly replace or fix the clip. Step one: Thread your need with 30cm of matching thread. Step two: Place the clip along the track of the weave, with the clip teeth facing outwards. Step three: Sew a loop through either one of the upper holes in the clip. Be sure to to push through the stitching of the track. Step four: Tie a knot to secure the clip in place. Step five: Sew several more loops through the same top hole, and secure in place with another knot. Step six: Snip off the loose thread. Step seven: Repeat the above with the other top hole of the clip. Step eight: Now thread the needle and push the needle through the top of the track at the centre of the clip. Step nine: Loop it around and tie a knot. Step ten: Sew several more loops around the centre of the clip. Secure in place with another knot. Step eleven: Cut off loose threads and wiggle the clip gently to ensure it’s secure. What does Remy (Remi) mean? Remy (or Remi) hair extensions are made of real human hair, and are considered to be the highest quality hair extensions available. This is because the utmost care is taken when they are being created. The key element to their quality is that the cuticles are kept intact and not stripped. Preserving the hairs cuticles, and aligning them in a unidirectional fashion, creates extensions that are completely natural in appearance and texture. This process ensures that the hair remains super soft, shiny, silky and completely tangle-free throughout its lifetime. Find out more about Remy hair extensions here. Virgin Remy hair is hair that has been completely unprocessed. For extensions to qualify as virgin hair, they must meet rigorous standards. These include; not being exposed to heat damage and harsh agents such as cigarette smoke and drugs , been permed, dyed, coloured, bleached and/or chemically processed in any way. It also means the hair comes from a single donor, and all the cuticles are completely intact, running in the same direction. This hair is extremely expensive, if it isn’t expensive then question the supplier.